I first met Saïd (pronounced sa-eed) Amin about six years ago at the Daily Grill in Washington DC. At the time he was close to launching IranianPersonals.com and wanted to collaborate with iranian.com. It wasn’t long before I realized that he meant business. He knew what he wanted and he was going to get it. And he did. Today IranianPersonals,com is by far the most professional and successful site of its kind. And he has expanded to other ethnic markets as well. I did a little email interview with him in the hope that he would share some of his secrets to success. I know this will be seen as free advertising for my biggest sponsor. But that was not my intention when I asked Saïd for an interview. His influence on the Iranian online community has been tremendous. He has been instrumental in transforming the dating habits of a significant segment of Iranians, and, more important than that, he is one of the few who has developed a financially successful Iranian site. What triggered you to get into online personals business? Do you remember the first day you thought of it? One winter day in the year 2000 while surfing the Internet (*ahem* at work of course), I stumbled into Iranian.com. The concept, content and geographic reach of this netzine was just amazing. I mean, Iranians from all over the world were writing in and accessing the site on a daily basis! *whoa* I had never before seen such an effective and moving online Iranian community. This was the first time that I really absorbed/appreciated the incredible reach and effectiveness of the Internet as a medium to unite and inform people (we all owe a BIG thank you to Jahanshah Javid for giving us such an amazing forum!). So, after several nights of concocting a strategy, I hired a web designer named Michel Soudee, who later became my partner, to create an Iranian portal. It was called PersiansUnite.com and its mission was to promote Iranian culture and Iranian American talent. The site’s services included a calendar of events, interviews, a store and a personals section where Iranian singles could meet. Before you knew it, my mind was obsessing day and night on my newfound hobby. Whatever “disposable income” I had was going towards developing this little website that honestly was big in ambition but short on time and funds. I quickly realized that the Personals section of the site (later be known as IranianPersonals.com) was the best thing this portal had going for it. I saw it as an effective and valuable tool that could connect people from all over the world and the only piece of the portal that I could sustain and grow given my time and financial constraints. Long story short, I stopped working “for the man” in 2001 to pursue the Personals industry full time. IranianPersonals.com / World Singles were still in their infancy but I believed in my vision to just go for it and let the chips fall where they may. For several years prior I searched high and low for answers, talking to anyone and everyone for advice and a sense of direction. It wasn’t until I stopped looking outward for answers that I discovered my own reality. I finally paid attention to what my heart was yearning for and realized that I could no longer ignore the obvious: being an entrepreneur was always my raging spirit inside. All too often we choose careers in certain professional fields to make others happy. We look for repeat validation that the road we desire to travel is the right one and we allow the fear of failure to handicap us from pursuing our truest and purest passion(s). I made myself a victim of this cycle for years and the decision to pursue my own path, on my own terms was not an easy one, but at the end of the day we all reap what we sow. Has your dream come true? Have you set new goals? While not quite a “dream” per se, my desire is to continue to grow both professionally and personally. There is no benchmark figure for the business that will one day make me say “Woohoo, I made it!” As far as I see it, I’ve made it already because I get to do something for a living that I am passionate about. Granted, we all measure success differently but I get a chuckle out of people who claim that they will finally be happy when their personal net worth or company reaches some ungodly monetary figure. My belief is that if you do not enjoy the process you are missing the whole point of life. As long as I enjoy the journey and challenge myself to grow professionally and as a man, life is good. As for the second part of the question, the goals today are the same as they always were: to continuously improve the service that we offer our members and to develop new features/services that address people’s needs. This is a tricky question but I’m curious to know what experience has taught you about Iranian dating habits? Have you noticed any difference between people who choose to date online and those who don’t? What’s unique about them? Whoa, great question Jahanshah. Well, let me start by saying that I am no psychologist but here’s my 2 cents worth. Dating? Yani chi? I thought that as Iranians we had to be engaged in order to “date”? 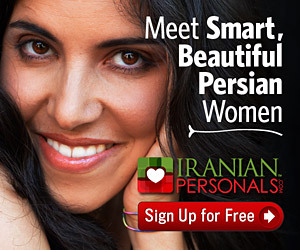 =) With more than 100,000 members on Iranian Personals, it goes without saying that there are plenty of men/women meeting everyday on and off the site. Now, if you ask many of those folks where or how they met, chances are slim that many would attest to using IranianPersonals.com or another Iranian singles or friendship site. They are “closet users” as I affectionately like to call them. This taboo has already changed in mainstream American culture where the online medium to meet people is no longer frowned upon. This acceptance, albeit slower, is also occurring in the Iranian community and in many of the other niches that World Singles operates in. Is there a difference between people who choose to date online and those who don’t? Mmmm, not really. The people online are the same men and women whom you may meet out in public. The truth is that the makeup of any singles site runs the gamut. You have all types of people online. Good people, rude people, polite people, CEOs, professionals, the insecure, introverts, extroverts, humble people, shallow people, etc. The key is to use a site’s search filters to weed out those members that do not meet the criteria(s) that you are looking for in a partner or friend. Unlike most personals sites World Singles member profiles are some of the lengthiest in the industry. Yes, it can be drag and time consuming to have to answer all those darn questions we ask but knowledge is power. I feel that the more you can read about a person’s interests, opinions, lifestyle, and mannerisms (how they express themselves on paper), and vice versa, the better one can gauge potential compatibility and find a match. What has been the most surprising (good/bad) aspects of the personals industry? The good includes the myriad of success stories that have come from our members. We have heard of dozens of weddings (even people that I know!) and countless testimonials from members thanking us for helping them meet that special someone. As for the Personals industry as a whole the real good news is that some 40 million Americans visited personals/dating sites in August 2003, according to a report published by The Online Publishers Association and ComScore Networks. What has impressed me most about your business has been the way you have used professional marketing and advertising tools, which is rare among Iranian businesses here in the U.S. For instance your Iranian Personals commercial on MTV and on other mainstream TV channels in southern California were brilliant, I thought. Why do you put so much faith (and money) in high-end advertising? Thank you for the kind words. I believe that advertising in main stream media where there are large concentrations of Iranians sets us apart from the competition and helps empower the Iranian American community as a whole. With all the hardship, killing and perpetual negative spin about Middle Easterners, I felt that a positive Farsi speaking ad (English subtitles) promoting love, relationships and the right of women to choose their significant other is a win/win for the Iranian American community and for IranianPersonals.com. From a business standpoint, the word of mouth that occurred after we aired our commercial in several markets was tremendous. I expect that we will continue our marketing efforts in main stream media so keep your eyes and ears open for a new ad soon!